The Saki Gouzanyama Kofun is a keyhole-shaped keyhole in the early middle of the Kofun period, located in Saki Hanmon door in Nara City, Nara Prefecture. 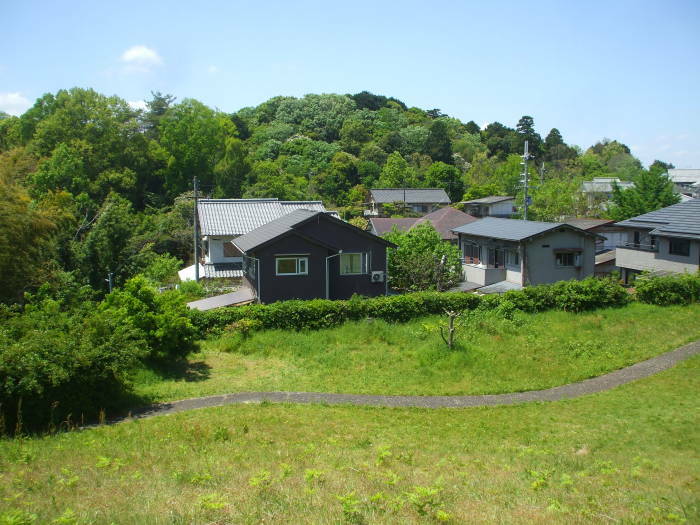 It is one of the Saki Shield column ancient tomb group, which is often referred to simply as Gurusan mountain tumulus, but here we use this name to distinguish it from the Guruzan mountain tomb located all over the country. This ancient tomb is designated as a national historic site. Below is the map reference. I'm approaching from the east, from the Kofun of Empress Iwa-no-hime. Let's approach this from the Kofun of Empress Iwa-no-hime. In the first picture below, I'm on a small lane running west between some farm fields. I have stopped and turned back to look to the southeast. 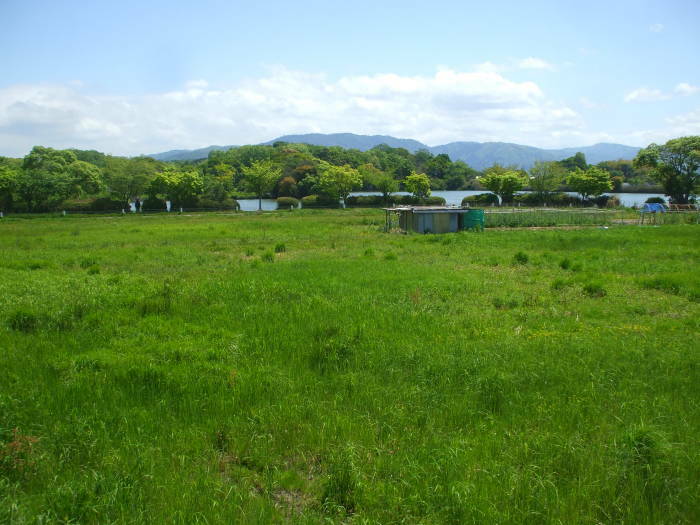 The Minakami Pond is nearby. Beyond it is the ancient Imperial palace of Heijō-kyō. The city of Nara is beyond that. The mountains on the horizon are beyond Nara. Beyond the small farms is a subdivision. 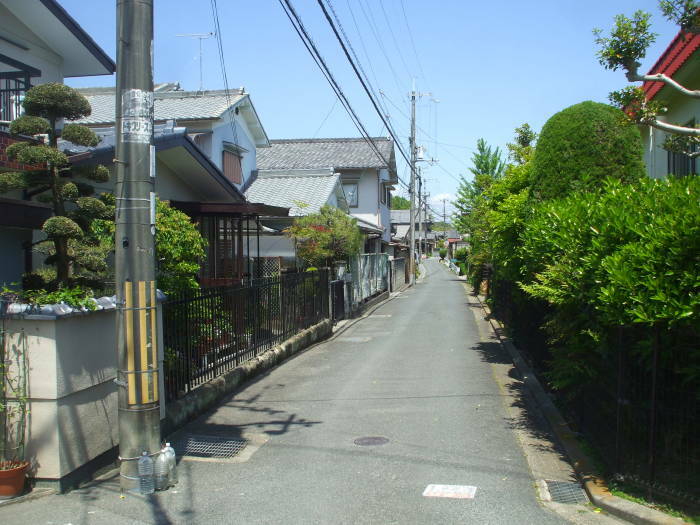 Narrow streets, no lawns around the houses. I have arrived at the mystery kofun. It is a small park with houses to the east and west and a pond to its southwest. There used to be a mound, the Marubuka tomb, very close to the southwest. 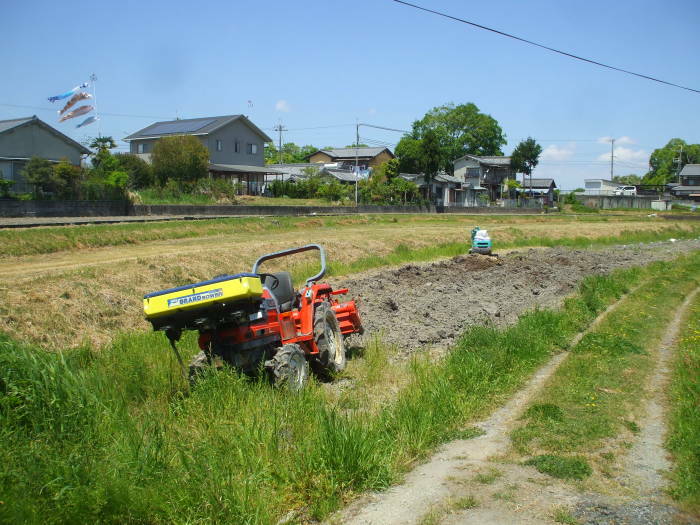 The moat did not extend all the way around this kofun. That other mound has since been destroyed, a pond is there now. 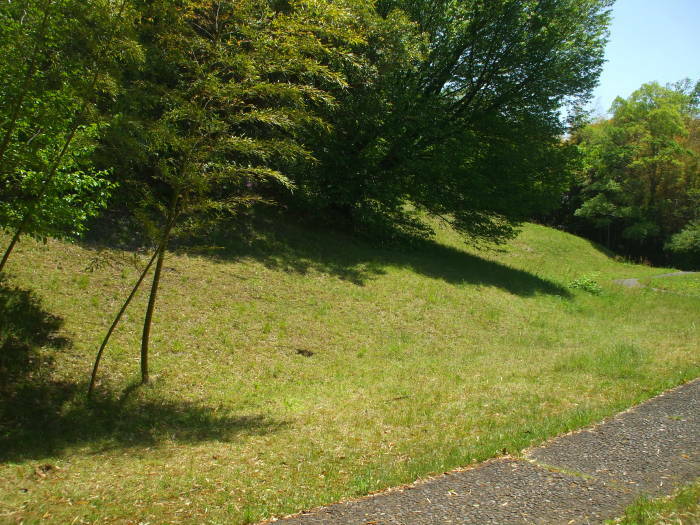 The Japanese Wikipedia page for this kofun says that some excavations were done in 1913. "Taishō 2 years" is a reference to the 123rd Emperor, Taishō, meaning that the date was in the 2nd year of his rule. Taishō took the throne in the middle of 1912. He had contracted cerebral meningitis within three weeks of his birth and was never completely healthy. His neurological problems had worsened and were continuing to degrade when he took the throne, and Crown Prince Hirohito was named sesshō or Prince Regent in November 1921. Hirohito became Emperor when Taishō died in 1926. A path circles the kofun. The grass is beat down along informal walking paths that have formed by people walking up and over the peak of the mound. 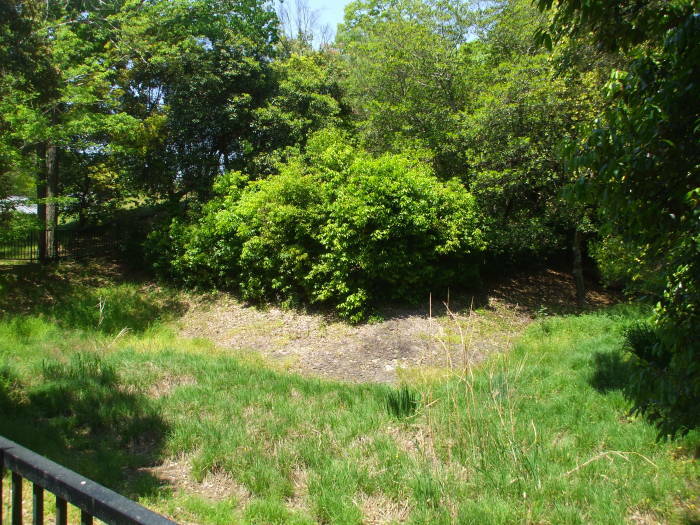 Clearly this kofun isn't believed to have any connection to the Imperial house. 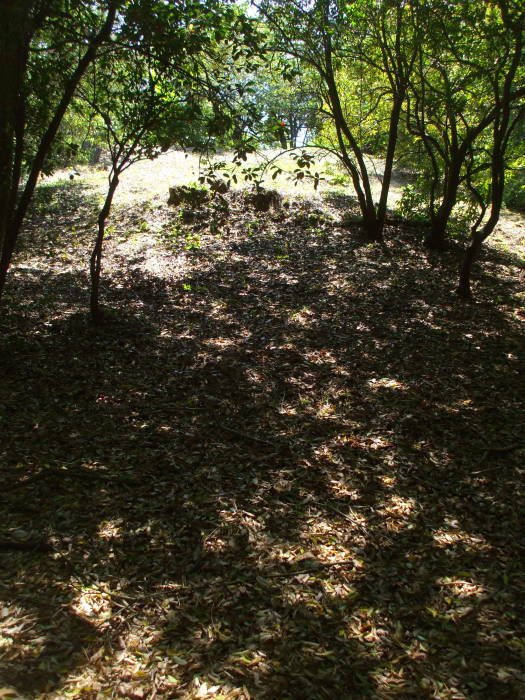 This anonymous kofun is at the northeast edge of a cluster, three of which are considered to be Imperial tombs.